St. John's Church was then located on Hickory Street, South of Broadway and now on 6540 Main Street in Williamsville. The first Home adjoined the Church property and was a former parsonage purchased for $2,000.00. The total cost of enlarging and furnishing the Home was $5,257.76. In Apri11865 a widow entered the Home as matron, her five children constituted our first orphan family. To relieve the congested condition at the Home on Hickory Street, the Congregation purchase, 20 acres of land on the West side of what is now Harlem Road, South of Buffalo Creek, in West Seneca in 1868. The property had been a health resort called Sulpher Springs, containing several springs and the Chase Hotel to accommodate the patrons. St. John's Home was soon known as the Sulpher Springs Orphan Home by the community. A few years later an additional 85 acres of land was purchased at the same site. The Hickory Street Home was reserved for girls and the boys were moved to the springs where they occupied the old hotel until February 23, 1876. On that piercing cold night 34 boys were driven out by a fire which destroyed the building. Quarters were arranged in the old Chapel nearby for the older boys while the younger ones were temporarily sheltered at the girl's home on Hickory Street which had been enlarged a few years earlier. The cornerstone for a new building on Mineral Springs Road was laid on July 16, 1876 and the dedication was on August 15, 1877. The original cost of the new home, including the 105 acres at Sulpher Springs was $38,750.00 and the girl's Home on Hickory Street was $12,182.00. For 32 years St. John's Church had assumed the entire costs alone. In 1897 the constitution was amended to enlarge membership of the Board of Trustees by including a representative from every Evangelical Lutheran Church in Buffalo, which at that time was part of the New York Ministerium. From then forward, congregations of Buffalo and vicinity cooperated loyally and financially in the support of ‘the Home. The same year, the Ladies Auxiliary was organized and the cornerstone of the new wing at the Sulpher Springs Home was laid. The new wing costing $40,000.00 was dedicated on the day of Pentecost, 1898 and resulted in the uniting of the boys and girls one home, Erection of additional buildings including a small hospital in 1908, modernization of old departments and the organization of building fund drives were programs that developed with the passage of time. The fiftieth anniversary of the Foundation of the Home was duly celebrated in 1914 and at that time it was announced that a total of 701 children had been cared for, (430 boys and 271 girls). The modernization of the Home was a great problem confronting the Board and in 1921 a building fund program was launched with its aim of raising $1OO, OOO.OO. With the cooperation of every Lutheran Church in Buffalo and vicinity resulting in 7,327 contributors, a total of $197,874.08 was raised. The same year the remodeling of the old building began and the following year the new schoolhouse with a gymnasium was erected, costing $87,000.00. The wide scope of the improvement plans took many years to complete. During this period additional land was purchased, the old barns were razed and five new farm buildings were erected on this newly acquired property. These farm buildings included two residences for two farmers and their families, two large barns, one for storage, another complete with stalls for a herd of dairy cattle and several teams of horses, hog pens and a hen house. The farm staff raised garden produce for the kitchen and feed for the livestock. Boy’s and. girls had separate corridors and dormitories. There also was a nursery, four class rooms, and the gymnasium which also served as an auditorium, a chapel, dispensary, infirmary, a library of 1,500 volumes and two shop departments; one for carpentry, the other for sheet metal work. Classes ranged from nursery to grade 4, after which education was continued at the Buffalo Public School 70 and at South Park High School. The Home had its own modern bus for transportation to and from the schools. Supporting the staff and the young guests were a large kitchen and pantry, a bakery, dining hall and a fully equipped laundry. A dental clinic was equipped with modern fixtures and a medical examination room was reserved for physicians whose services were available at any time, day or night. Cost-free medical and dental attention was provided by non-resident dentists and physicians. On the grounds there were tennis courts; a baseball diamond, playground facilities, a two run toboggan slide, an orchard, a picnic grove having open side shelters and outside cooking arrangements. In 1956 a concrete swimming pool was built by contractors who furnished materials, equipment and labor as a charitable gift. The community organized a cement fund at the rate of $1.10 per bag by placing slotted tin cans in business places. During the summer time a source of income came through voluntary contributions made by church and fraternal organizations for use of the picnic grove. Life at the Home was far from monotonous; the staff and children were collectively known as the Family and as such they thoroughly enjoyed themselves. Looking through copies of St. John's Tidings, first published in December 1921, we were impressed by the number of planned social events. We read of parties for Christmas, St. Valentine’s Day, Halloween, July 4th fireworks, plays, choirs, band concerts, Scout Troops, visits by professional entertainers, group sponsored bus tours, free ball games at Bison Stadium and many more. A happy and full childhood experience for the young children has been the main mission of the Trustees, the auxiliary, the household staff, and volunteers throughout the years. In 1932 the Home operated with total expenses of $37,357.00. But in the years to come, especially after World War II, the annual budgets escalated to well over $100,000.00 and the rise continued upward even though the farm furnished most of the table requirements and the medical attention was gratuitous. State inspections were routine until authority’s proposed radical change. Their specifications involved cancellation of gratuitous medical and dental care in favor of a salaried resident physician, nurse, dentist, case worker and psychiatrist. During the last 4 years of operation the Home had depended largely upon voluntary contributions for support and the proposed changes would increase the budget to over $ 225,000.00. After consideration by the Board of Trustees, it was determined that the augmented figures were excessive and beyond reach considering. The limited sources of income. The alternative course was to close the Home. There were 62 children at the time and some were placed in foster homes, others at the Protestant Home for Children in Buffalo and the balance received County Welfare attention. The protectorate formally closed at the end of 1960.
disregard the changing pattern of the new methods the State had adopted for providing child care. In order for the Board to comply with these changes and still provide financial support to youth related programs, an application to change the certificate of incorporation was made to the Supreme Court of the State of New York. On October 11, 1962 a change was granted to expand the territory of service and restating the purpose to read that "The Corporation is constituted for the purpose of protecting, relieving, maintaining or assisting needy, underprivileged or delinquent children in the Fourth. Judicial Department of the State of New York, directly or through gifts or other assistance to institutions or agencies engaged in the same or similar purposes, with the power to establish and maintain an institution for any and all of the foregoing purposes." In 1965, $100,000.00 to Lake Chautauqua Lutheran Camp, half as a grant and half as a non-interest loan. With these funds it allowed the Camp to complete the construction of St. John's Hall and the purchase of the adjacent Girl Scout Camp. Since 1975 we have granted a minimum 'of $10,000.00 each year for maintenance and program support supplemented by additional campership grants each year. In 1984 our grants to L.C.L.C are $26,000.00 and $6,000.00 respectively. In 1966 and in 1968, at the request of the Protestant Home for Children (now Gateway-Longview Inc.) the Board authorized the purchase of two homes, one in North Buffalo and one in South Buffalo at a total cost of $ 72,000.00. St. John's Home retains the title to these homes and they are leased to Gateway-Longview for $1.00 per year each, for their use as a half-way home for young people after leaving a larger institution and before being old enough to go on their own to support themselves. In 2010 both homes were sold since Gateway-Longview no longer needed them and the assets reinvested. In 1967 a grant/loan of $275.000.00 was made to the Lutheran Home for Children in Jamestown known as "The Gustavus Adolphus Home." Half of this amount was an outright grant and the other half was to be repaid over a 20 year period. This loan amount of $ 137,500 was subsequently forgiven by St. John's. This Home ministers to children and youth who require specialized attention and is under the administration of the Board of Social Ministries of what was known at the time as the Upper New York Synod. In 1970, The Board of Trustees secured the services of a Youth Director who assists the LCA, now ELCA Congregations of the Niagara Frontier District, now conference, in their youth activities and concerns. The Home has been the primary financial supporter of this program since then and in 1984 a grant of $36,000.00 was authorized, plus an additional $1,900.00 for their confirmation retreat programs. The above activities have been the recipients of the larger grants during the past twenty years but many other programs have also shared the support of the Home, for their concern and work with the youth of the area. 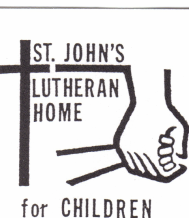 Since the Resident Home closed its doors in 1960, St. John's Lutheran Home for Children has expended in grants and seed monies over $4,000,000.00.